Plus a few lovely Cornish spots in the surrounding countryside! 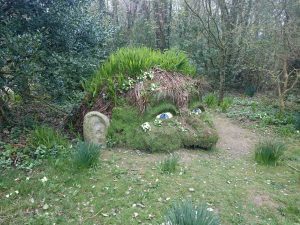 Camel Trail Tea Garden, Bodmin – ah this place was great! We were doing a camel valley trail bike ride and hadn’t taken any lunch with us. 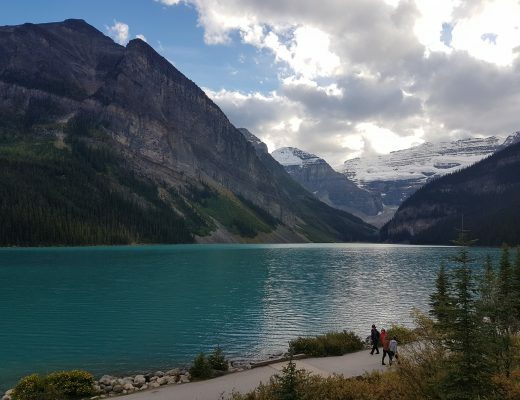 We stopped here and it turned out they had a load of gluten-free options! I had an ace fresh crab salad with gluten-free bread. They also had gluten-free cake, can make gluten-free sandwiches and jacket potatoes. The garden is lovely so we had a nice sit in the sun to rest our weary legs. Family-owned. While on the trail, I would recommend a little pit stop at the Camel Valley Vineyard for a glass of Pinot Noir Rose Brut (mmmm). Becks Fish and Chips, Carbis Bay – for a proper gluten free battered fish and chips dinner, this place is a good bet. They have a wide gluten-free range on offer (fish, scampi) and a separate fryer so it is all very coeliac friendly. You can eat in or buy to takeaway. I even got chatting to a fellow coeliac in the queue who is a regular and assured me she had eaten there safely dozens of times. Amanzi – seriously meaty South African cuisine with the gluten free options marked on the menu. Beerwolf Books – a really cool pub/book shop with a haul pf pinball machines! They serve gluten free Mongozo beer here. The Brig – we passed this place and I spotted lots of gluten free pub grub items like nachos, glazed ham, lamb shoulder and chips. You should enquire about the fryer if you are coeliac. Extensive cocktail menu to wash it all down! The Courtyard Deli & Kitchen – next to Beerwolf Books, this lovely little cafe with outdoor space had a number of gluten free options on the menu and offered gluten free bread when we visited. Create Arts Cafe and Dessert Bar – gluten free sandwiches. Right next to the maritime museum. The other restaurants nearby also had gluten free marked up on their menus – Zizzis, the Shed, the Ranch and the Shack were the ones we spotted. The Harbour Lights – we didn’t visit this place ourselves, but I hear they offer good gluten free fish and chips if you preorder. 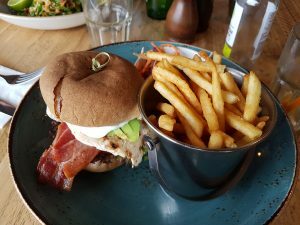 The Meat Counter – a burger restaurant offering gluten free buns. 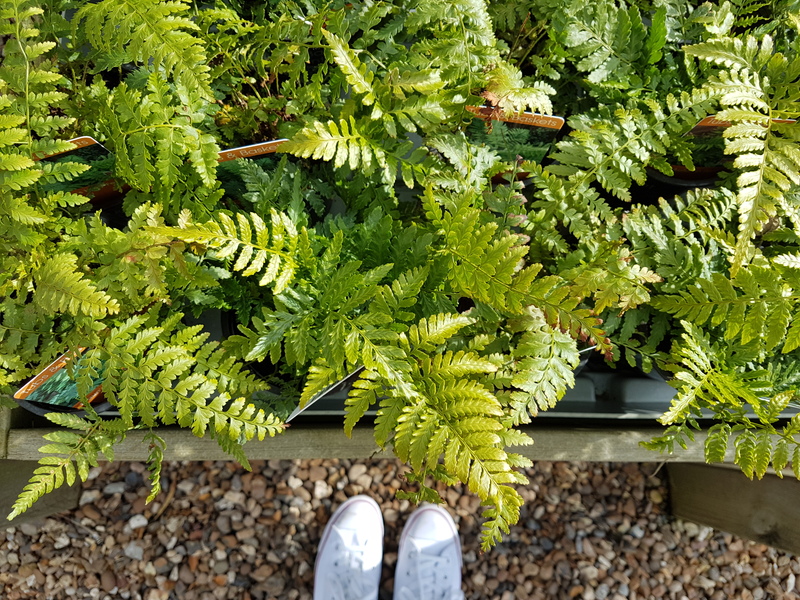 The Natural Store – lots of gluten free supplies for home catering, also a little cafe at the front with some gluten free lunch options to take away, as well as Honeybuns cakes. You can buy gluten free pasties and pies to bake up at home. 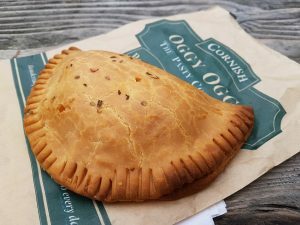 Oggy Oggy – on the high street, they serve gluten free pasties and cakes. The pasties are from individually sealed bags, then are heated on a dedicated gluten free tray and they know to use clean tongs etc to serve. Takes 30 minutes for them to bake a gluten free pasty, so preorder and then go for a little wander. I tried one of the veggie cheese pasties (the other gluten free pasty flavour is steak), which was tasty and filling. Oggy Oggy had a few gluten free cakes available too when we visited. 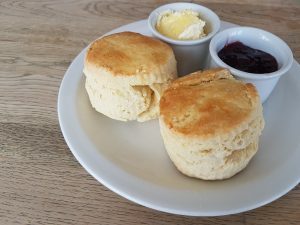 Raggamuffins – gluten free cream teas. 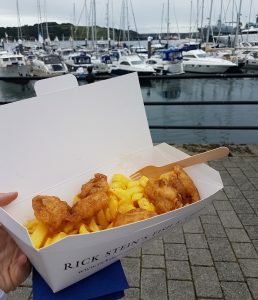 Rick Stein Fish & Chips – here in Falmouth they do gluten free battered fish and chips cooked in a separate fryer and they even have gluten free chip vinegar. I had the cod bites and chips – the cod bites were excellent with good crispy batter. The downside of Stein’s is that is it pretty pricey (small cod bites and chips were over £8!). 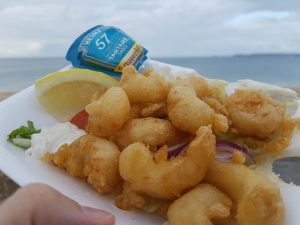 The Shell Bar – another chippie with gluten free fish and chips. They also have an eat in menu, which has gf options marked up. The Stable – gluten free pizza available here. Catch – fish and chip shop with gluten free battered fish and chips made on request. Call ahead. 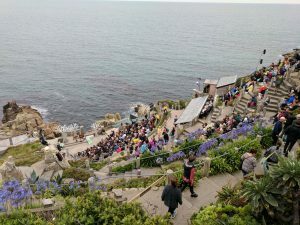 We took our own supplies to the Minnack, but when we were there last summer there was a hot food stall that was entirely gluten free, called Katie’s Cornish Hot Pots. The Beach Hut – just up the coast from Newquay in Watergate Bay. We visited as one of my lovely coeliac followers on Instagram works there and recommended we come for a visit. 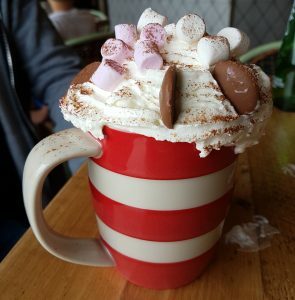 The food was excellent, with plenty of gluten free choices, plus you HAVE to try their huge chocolate-button-topped hot chocolates for dessert. They use a dedicated gluten free fryer for fries and have gluten free buns available for burgers plus gluten free bread for other dishes. I had the chicken bacon burger and we also tried the thai fish with peanut salad and pineapple sambal (which was epic). The restaurant is right on the beach so you can watch the surfers while you eat. It is dog friendly and they have a gluten free kids menu. Cloud Cafe – for gluten free pasties and cakes. They also have extensive gluten free choices on their menu. The Padstow Pasty Co, Padstow – gluten free pasties! Both meat and vegetarian available, tasty pastry with good fillings. They cook to order, so you can pop off to look at the shops for 15 mins and then come back to a nice hot gluten free pasty! The Seafood Restaurant, Padstow – we visited this Rick Stein establishment for a celebratory birthday lunch. They were very capable at catering for a gluten free diet and once we got hold of the waiter he helpfully ran through what we could and could eat, and provided gluten-free bread. 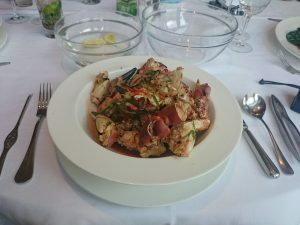 The food was good (see my Singapore Chilli Crab, gluten free style, below) but maybe a bit overpriced (we went a la carte – they have a set lunch menu that was much better value). Service was a bit slow, but perhaps they were just having an off day when we visited. Overall certainly worth considering if you are staying in Padstow as they did a good job on the gluten-free front. 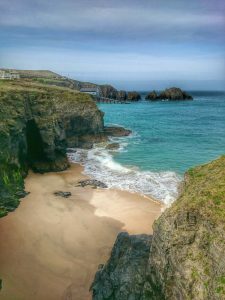 Rest A While Tea Garden, Hawkers Cove – break up your coastal walk with a stop at this cliff-top cafe round the coast from Padstow. Gluten free sandwiches and gluten-free cream teas on offer. Stein’s Fish and Chips, Padstow – coeliac-friendly, cooking chips in separate fryer. The lovely people at Rock Stein’s tell me they now offer gluten free batter too, hooray! Staff were totally clued-up on allergens and were really helpful. Note though that a sneaky one to avoid is the tartar sauce – the mustard powder in their homemade version contains gluten (the staff made me aware of this). 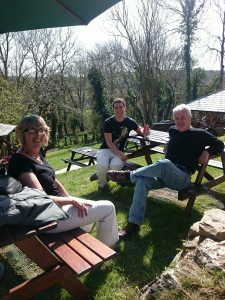 Healey’s Cornish Cyder Farm, Penhallow – cider cider everywhere! Cider farm with animals to keep the kids happy and lovely outdoor pub area to keep the adults happy :). Varieties available to taste and pints available to buy. The Pear Rattler was my favourite. Restaurant Nathan Outlaw, Port Isaac – an absolutely wonderful two Michelin-starred restaurant. 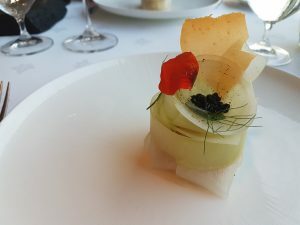 Chef Nathan Outlaw was cooking when we visited and the experience was fantastic. The restaurant focuses on sustainably-caught, Cornish seafood and on offer is a seafood tasting menu at £99 per person. 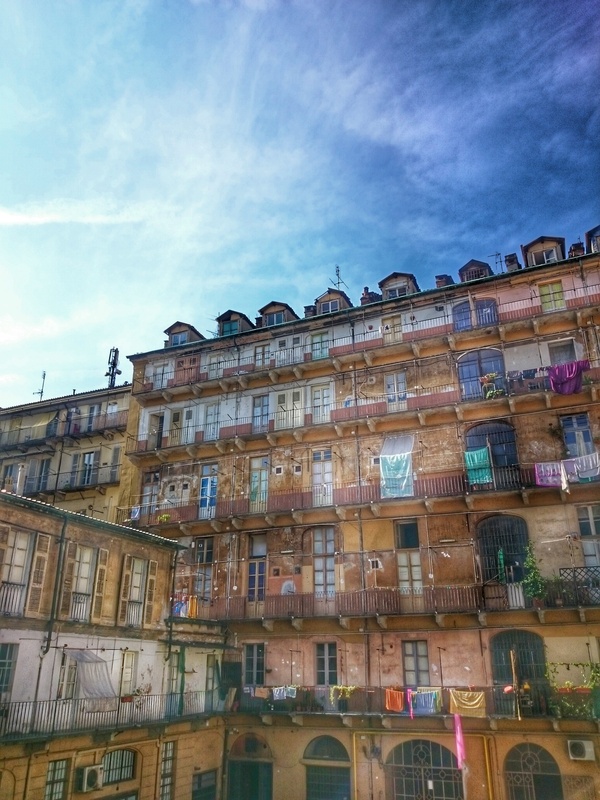 If you book 48 hours in advance they can cater for gluten-free and other allergies, as well as vegetarians. Two of our group were coeliac, plus one of the coeliacs was also lactose intolerant, hence we needed one gluten-free set menu and one gluten and dairy free set menu. The restaurant did a fantastic job of creating alternative gluten free dishes for us that were very similar to the main menu. They went the extra mile in even making special gluten free lentil crackers for one of the dishes, to replace the standard wheat crackers. Food was beautifully presented and utterly delicious. Lots of interesting pairings and combinations. 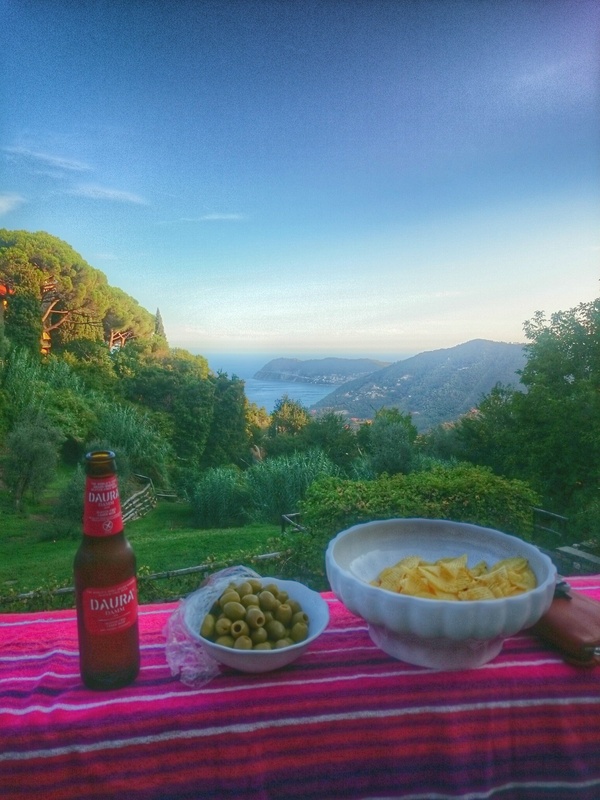 Plus, the restaurant’s location means you get a fantastic panoramic view across the sea. A really exceptional meal. We loved it! While on the topic of cider, Cornish Orchards Cider is also worth trying. We had a nice cool bottle of the original apple variety when visiting the Lost Gardens of Heligan in St Austell. The Allotment Deli – some gluten free biscuits and treats are often available here. Beer & Bird – gluten free fried chicken! Blas Burgerworks – they offer gluten free buns. 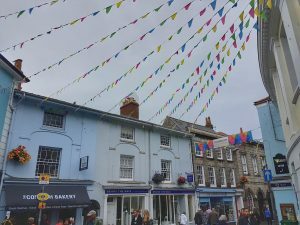 The Market Place Tea Rooms – a tea rooms offering gluten free cake and gluten free Cornish pasties. 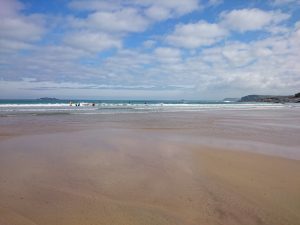 Porthmeor Beach Café, St Ives – all gluten free items marked on the menu. Lots of delicious tapas options and gf puds too! Plus lovely view over Porthmeor Beach and there’s a surf school attached. Porthminster Beach Café, St Ives – a multi award-winning seafood restaurant. Lovely food, excellent service from staff who showed good knowledge of gluten free. They provided me with a menu marked up by the chef indicating what I could and couldn’t have. They also successfully catered for a nut allergy in our party. Nice views over the bay too. 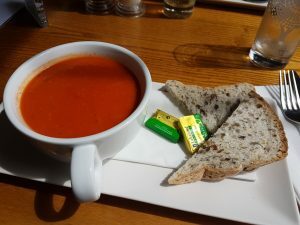 Scoff Troff Cafe – gluten free bread is available here for their sandwiches and lots of dishes can be adapted to make them gluten free. The Searoom, St Ives – wonderful range of gluten free tartlettes, sandwiches, scones and cakes on offer. They pretty much have a gluten-free alternative for everything on the menu! Bacon sandwich, crab tartlette, cream team and cakes were all good…including an epic plum and almond cake that even the non-coeliacs in our group were lusting after. I can also personally recommend the gluten free cream tea! For really good fish and chips, check out Becks Fish and Chips in Carbis Bay (details above), as this is right next to St Ives. Madelines Tea Shop – “their gluten free pasties – are the best! Amazing pastry and great filling” (Jane Q) and “they do a variety of gluten-free cakes” (Surfandsailz38). 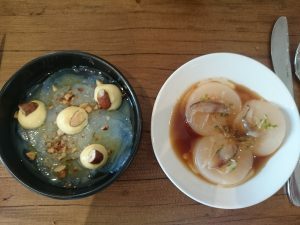 Pels – “Excellent gluten free selection of food that actually tastes good. I enjoyed a gluten free pizza and a gluten free pancake” (Wilkinson252), “if you are coeliac and need to find somewhere that does proper gluten free food, Pels is great…they had a great and very varied gluten free menu” (Colly39), “good knowledge of gluten free and explained awareness of cross contamination so you felt confident eating there” (Travellergirl20). Food aside, I really recommend kayaking in the river near St Mawes. You can hire kayaks in the harbour and they will show you the route to take – so much fun! Taylors – this little cafe is brilliant for gluten free and the owner is coeliac (and does the cooking), hence you are in safe hands! They do gluten free pizzas, panninis, crepes, scones, cakes and more. The owner told me he wants people to be able to have the gluten free treats they would normally miss out on – what a gem. 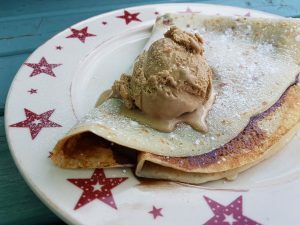 I had a gluten free chocolate-filled, salted caramel Cornish ice cream-topped pancake of dreams. Cornish Arms – another one in the Rick Stein empire. I actually really liked this pub, and they did great gluten-free options. They had gluten-free bread so I was able to have sautéed field mushrooms on toast with rocket and parmesan salad. Also, their chips were coeliac-friendly and the grilled hake was beautifully cooked. Big beer garden so you can sit outside if it is a sunny day. I enjoyed eating here much more than the main Rick Stein seafood restaurant in Padstow. On St Michael’s Mount itself, I found lovely local icecream available in mini tubs at all the icecream huts – perfect for avoiding cross-contamination. The cafe there had a couple of gluten free options too, including gluten free cake. 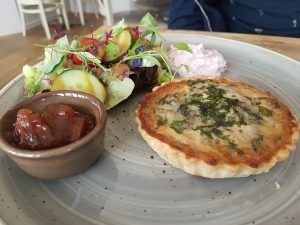 Cutty Sark Restaurant – off the Mount in Marazion, this pub was very helpful at advising which menu items could be made gluten free. They also had gluten free bread available. We stopped for lunch, but staff told me most of their evening menu is naturally gluten free. 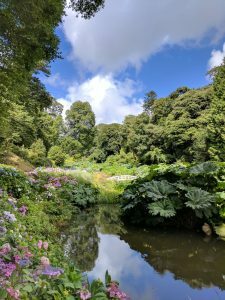 A quick mention that the cafe at Trelissick Gardens near Truro had quite a few gluten free options when we popped by. Choices vary each day but include dishes such as sausages, homity pie, baked potatoes and sweet options included gluten free cake. The Cornish Vegan – gluten free sweet and savoury options available here, marked up on the menu, at this vegan cafe. Driftwood – a short drive from Truro is this michelin starred eatery focused on local ingredients and sustainability. We had an amazing meal here for my birthday. Their cocoa husk sorbet on one of the dessert courses was developed to embrace the No Food Waste movement and tasted immense – I’ve never had anything like it! We opted for the long tasting menu and everything was excellent. 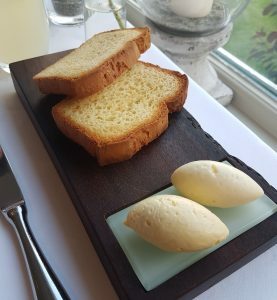 They catered very well for me as a coeliac, with minimal adjustments needed to the dishes and even giving me fresh gluten free bread and homemade gluten free linseed crackers. Recommended for a treat meal on the South Cornish coast. Flourish – lots of gluten free options. 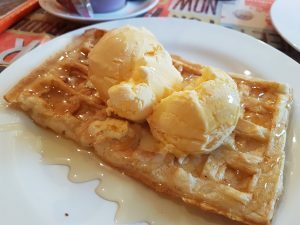 Lily’s – I spotted some gluten free options available at this cafe. Truro Lounge – they offer a dedicated gluten free menu. 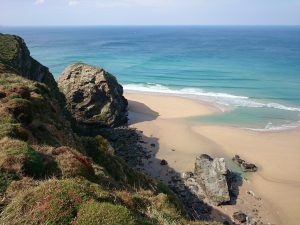 Enjoy beautiful gluten free Cornwall and check out some other gluten free travel guides while you are here!